The Buckeye OS W-65 is designed with a durable and well balanced steel frame which allows for a single person to move or transport the unit through doorways, around corners and into hard to reach places to extinguish any Class AB or C fires. The Buckeye OS W-65 is specialty designed to deliver exceptional performance and withstand harsh environments that are often found along the coastline and on oil rigs. The agent cylinders and the wheeled model frames of the Buckeye OS W-65 have a galvanizing compound undercoat, baked-on enamel top coat, and protective clear coat finish that is designed to prevent corrosion and fading from exposure to sun’s UV rays and environmental conditions from the sea. As with all of Buckeyes Offshore models, the Buckeye OS W-65 passes a 3,000 hour salt spray test. Wheeled fire extinguishers, such as the Buckeye OS W-65, can be found on Oil rigs, Boats, Boat docks, cruise liners, loading docks, shipping ports, harbors, boat warehouses, commercial buildings, military electronics, airports, aircraft/vehicle and or boat service centers, chemical plants, construction sites, storage units, loading docks, and any other building, businesses or area where a more significant fire involving sensitive electrical equipment may occur. 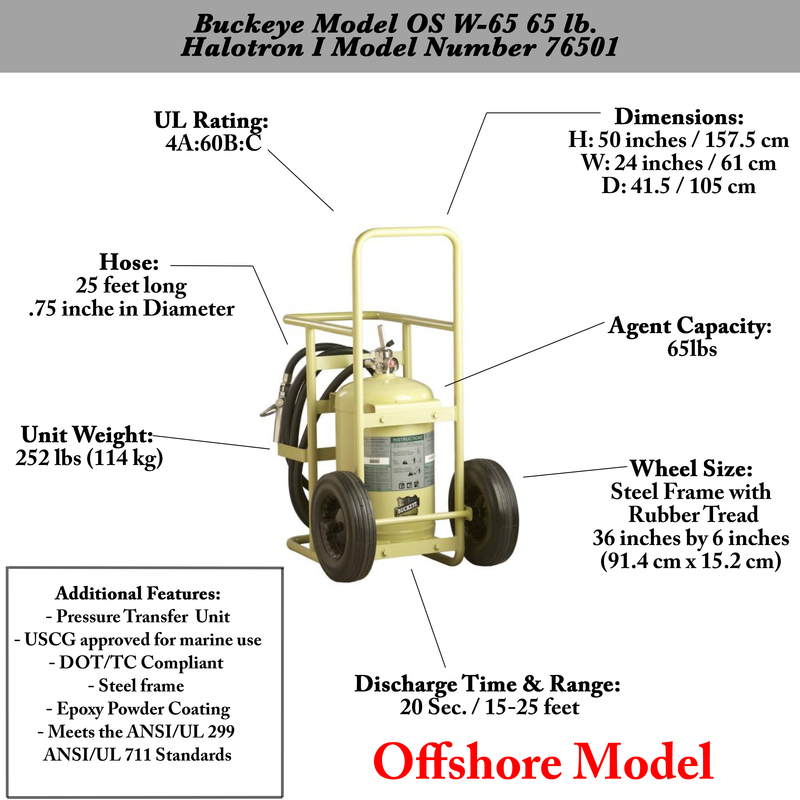 The Buckeye OS W-65 uses Halotron I as the Extinguishing agent. Designed with a 65lb agent capacity tank. Halotron I is ideal for Class A, Class B, and Class C fires. Additionally, the agent used, Halotron I, is considered a clean agent and wont damage sensitive electrical equipment unlike other fire extinguishers that are used on Class C fires. Note: The Buckeye OS W-65 can be used on Class C fires and is designed to be used on fires that involve sensitive electrical equipment. The agent (Halotron I) is a clean agent and residue free. The Buckeye OS W-65 is an Halotron I fire extinguisher. The Buckeye OS W-65 has a discharge time of 20 seconds of continuous spray and a range of 15-25 feet, depending on environmental conditions such as the wind, temperature, or humidity. The Buckeye OS W-65 weighs a total of 252 lb (114 kg). The Buckeye OS W-65 is 50 inches (157.5 cm) in height, 24 inches (61 cm) in wide and 41.5 inches (105 cm) in deep. The Buckeye OS W-65 comes fitted with a 25-foot hose and is .75 inches in diameter. YES!. 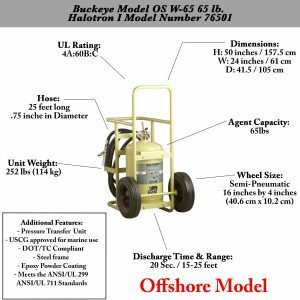 THE Buckeye OS W-65 is USCG approved, Offshore fire extinguishers have been designed to be used for offshore oil rigs or along the coastline where the harsh weather environment may cause rust or damage to the fire extinguisher.